The Growth Voucher programme intends to support 20,000 businesses throughout England who are looking to grow through the advice and engagement with accredited professionals. You have until the 31st March 2015 to apply for up to £2,000 in matched funding. 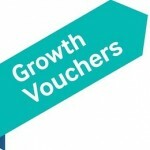 Growth Vouchers are only available from suppliers you’ve never worked with before. We can only offer this to new clients. The Growth Vouchers programme is available to small businesses in England who are actively selling goods and/or services, have a turnover no greater than £45m, own 75% or more of their business, and have 250 employees or less. (full eligibility and terms and conditions here). If you’d like to learn more, please contact us or call today on 01509 631136. Please hurry – the scheme ends on the 31st March. You can view our Growth Voucher profile here.